US-based automotive startup Rivian has just pulled the wraps off its first electric vehicle, the R1T pickup truck, just a day ahead of its official debut at the 2018 LA Auto Show. It seems that what Tesla has done for the luxury car, Rivian wants to do for the pickup truck industry, which has a major following in the United States. 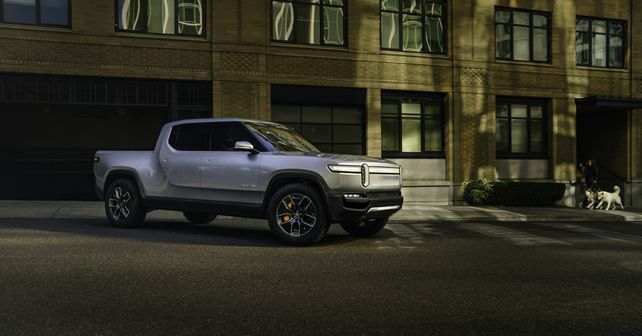 Just a day before its official debut, they have unveiled their first electric product – the R1T pickup. This five-seater truck, which will make its official debut at this year's LA Auto Show with the brand's electric SUV model, the R1S, is all about providing the off-road adventure experience as one would expect from a conventional combustion-based pickup truck. Talking about the numbers, the R1T boasts a driving range of nearly 650kms and features a Quad-Motor System. In simple terms, each wheel is powered by its independent electric motor, and put together, these motors produce close to 740bhp and can propel the 3.5-tonne truck from 0 to 100km/h in about three seconds! At the launch, the R1T will be available with two battery pack options – a 180kWh option and a lower capacity 135kWh version. Folks at Rivian will add a third 105kWh option six months post the launch. While the 650km range will be offered by the highest-spec 180kWh battery pack, the 135kWh battery pack option will be good for around 480km. All three battery packs feature fast charging tech, which means that an approximate driving range of 320km can be obtained just by 30 minutes of charging. The R1T also houses several storage areas, thanks to its 'skateboard' platform design, which efficiently packages the battery pack, drive units, suspension, braking and thermal system all below the height of the wheels, leaving plenty of space for the cabin and storage. Inside the cabin, passengers are greeted by three touchscreens – a custom 15.6-inch centre touchscreen, a 12.3-inch instrument cluster and a 6.8-inch rear touchscreen. The third screen provides infotainment and climate control access to rear passengers.